You get to learn to make cornbread mix! Your day is now complete. It’s borderline ridiculous how little time I have to spend on meal prep now. #life with teenagers #workingfromhome Or maybe it’s how little time I want to spend on meal prep. This, from a girl who loves to cook. The thing is – I love food and I love feeding people. But I also love efficiency and simplicity. I’ve learned to make a hearty main dish, then throw out the simplest fruit and veggie side dishes possible. It’s all nourishing and filling and it takes very little work. I love this so much. So when it comes to “bread as a side dish,” I very rarely have time or spend time or choose to make it a priority. After all, there are many more nourishing side dishes to choose from (tossed salad anyone?). I ran across this recipe for homemade Jiffy mix. We shared a meal with some friends in which delicious soup and cornbread was served. I decided that if I had cornbread mix on hand, it would save me a few minutes of meal prep and simplify my life. Instead of talking myself out of mixing up a batch of cornbread because of the extreme difficulty of getting out and measuring flour and baking powder (the struggle is real) I could just dump the pre-measured ingredients into a bowl and stir in the liquids. I adapted the recipe (included whole grains and cut out some sugar), multiplied the recipe to make it more efficient, stirred ingredients into a big bowl, and had six jars of muffin mix in less than 10 minutes. Funny how this simple task of making a mix ahead of time is so helpful. It doesn’t take much, you know? 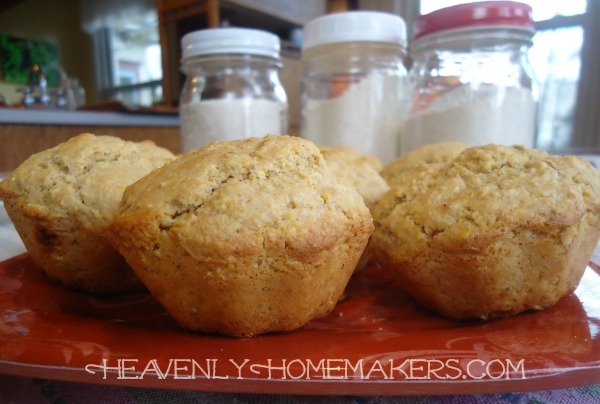 Will you save money making this cornbread mix yourself? I don’t know. How much is a box of Jiffy these days? They used to be 33¢ but I haven’t looked at them in several years. I didn’t do the math on this mix (because if I don’t have time to make cornbread I probably don’t have time to break down the cost of cornmeal). But I’m almost sure it only takes a few cents to make this – and I used 100% whole grain flour and organic cornmeal. Easy as that, you have cornbread. Are you like me? Do you find that mixing up bread to go with a meal is just a little too much effort (pitiful)? 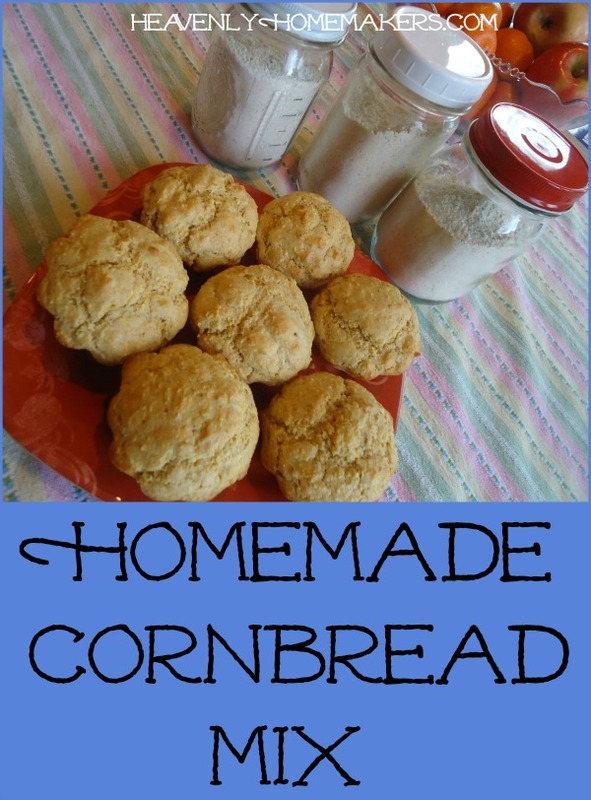 What do you like to serve with cornbread? I have been wanting a cornbread mix for ages, I buy Jiffy because it is convenient but am so happy to try a healthy alternative. Thank you! We love cornbread–especially with butter and cane syrup for a treat. I make two kinds–the regular with eggs, oil, and sweetener, and then what we call Nanny Cornbread, a recipe from my maternal grandma which probably comes from the time when Florida settlers didn’t have access to these things, since it calls for only cornmeal, water, and salt. Cast iron pan necessary, of course! Speaking of busyness, I feel ya! My work from home hours just doubled, and I have a homeschooled 6 year old and a toddler, plus a hobby farm. Now, I love to cook, but the best thing I have done recently is hire my mom to make our lunch weekdays. At first I felt so guilty, then I realized, this is such a blessing!! Do you have the original recipe , I only have All Purpose flour. Sorry, just re-read the post and saw the link. Would anyone have a suggestion as to what gluten free flours I could use to sub for the 4 cups of whole wheat flour? Maybe almond flour? 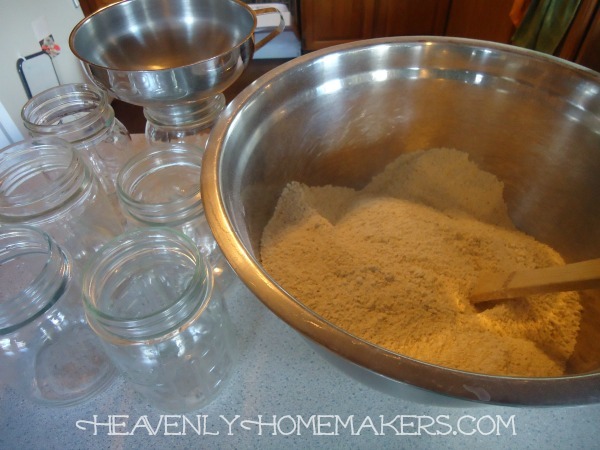 I try to use as little rice flour as possible because my son had a sensitivity as an infant. Thanks! Our family has to eat gluten free. I use Gluten Free Mama’s Almond Blend and add xanthan gum to make it “stick”. It works great for most recipes. :) Happy baking! Sorry. I just noticed the rice sensitivity. You can try straight almond or coconut flour, but you will have to alter (usually increase) the amount of moisture in your mix. You could also try a potato/tapioca/sorghum mix. I use the Simple Skillet Cornbread recipe from 100daysofrealfood.com. It is naturally gluten free as it is made with only cornmeal, no flour and sugar free. It is my families’ favorite corn bread as it is moister than those containing whole wheat flour. Make sure you are buying cornmeal that uses the WHOLE kernel of corn, as most brands don’t. I prefer Hodgson Mill Cornmeal as it is finely ground (Bob’s Red Mill isn’t). I do not have a cast iron skillet, so I heat a 9 inch square pan, per instructions, brush with butter and pour batter in pan. Since the recipe has no sugar I drizzle with a small amount of maple syrup. I make it ahead and freeze to have on hand for breakfast. Also, you could mix the Simple Skillet Cornbread ingredients ahead of time to make a mix, then add the melted butter, eggs and buttermilk/sour milk . I usually just measure out the ingredients while my eggs are warming in a hot water bath and milk is souring (10 minutes). Great idea to make this a bulk mix. If you plan to use coconut oil, I’d just cut that into the mix and store it that way. That would save a step and a melting dish every time you made them. For me that whole melting step always seems like a lot of hassle! I love this post! I live in Chelsea, MI…..the home of Jiffy Mix! From what I understand, cornmeal is like wheat flour in that the corn has been ground into a flour then sold much later in stores, yet it still contains small amounts of oil. So, as with whole wheat flour, there will be some degree of rancidity present in cornmeal that produces a little bitterness (usually covered up with sugar in the recipe). If the corn is freshly ground, however, it will have a better flavor. I have read that cornmeal oxidizes even more quickly than wheat flour. 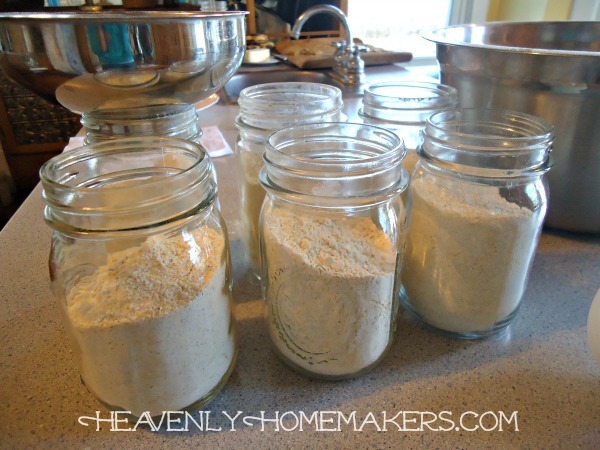 All this to say …you might want to let your readers know if they are creating these jars of mix to store and use later, it’s probably best to store them in the freezer if they contain freshly milled corn/wheat flour. Even then, they should be used up within a couple of months.